Our select range of skirting boards and architraves are available in a pre-primed MDF finish or a standard fifth redwood softwood material. 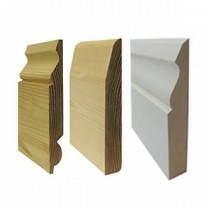 MDF - Pre-primed in white and in a selection of sizes for a quick install and finish. Softwood - The classic time-tested skirting and architrave material of choice.